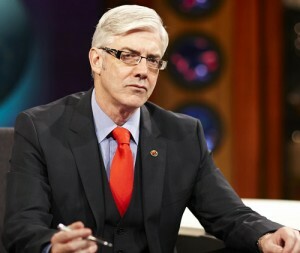 When the ABC announced its 2012 line-up in November 2011, one name really stood out: Shaun Micallef. After last appearing on the national broadcaster almost 10 years prior, he would be returning to the place where he became a star in his own right with a new show: Shaun Micallef’s Mad As Hell. There was not much said about what the show was about, except that it would have a spin on the news. Questions abounded: would it be like Newstopia? What about Your Gen? As Your Gen finished up, and the première came closer, more details were revealed. It would unashamedly build on the ideas of Newstopia, with sketches, character actors and interviews. But there would be some important influences from TAYG – mainly a studio audience and Shaun playing more himself and less of a character. The first 10 episode series began on Friday 25th May 2012 to a warm critical response. It rated 664,000 across Australia, healthy for the ABC. Each episode was shot at the ABC Elsternwick studios the Wednesday prior to airing on the Friday at 8pm (Shaun’s old Micallef Program timeslot) to keep it relevant to the events of the week. The ensemble cast includes Francis Greenslade, Roz Hammond, Emily Tahini, Veronica Milsom and Tosh Greenslade (no relation of Francis). Joining Shaun for the writing was most of the Newstopia team: Gary McCaffrie, Michael Ward, Stephen Hall and Tony Moclair. Yuri Woronschak composed the music, like all of Shaun’s shows. The ABC renewed Mad As Hell for two seasons in 2014, with the third season of 10 episodes starting on Wednesday 12th February, and a fourth season (also of 10 episodes) which began on September 24th. Stephen moved from a writers role to on-camera, and the writing team was expanded to include Alasdair Tremblay-Birchall, David M. Green and Simon Taylor. A fifth season of 10 episodes was a sure thing, beginning 11th February 2015, moving back half an hour to 8:30pm Wednesday nights. Veronica Milsom departed from the cast, having taken over the drive slot on radio station Triple J. In 2016, the show returned for 12 episodes and its sixth season, with Nicholas Bell joining the ensemble cast (for the season). For the first time, the whole season was positioned during a Federal election campaign. Season 7 followed with 12 episodes in late 2017, and two seasons of 13 episodes in 2018.
woul be great to see the abc show the movie! Sean. You rock. Sometimes you roll as well. Choice Bro. I feel kind of zingy after your show. Brilliant show, always has me in stitches. Bring it back ABC! I have a question for you to investigate. Who is paying for Schapelle Corby’s luxury villa in Bali? Lover the programme. Today’s report in The Age on the fiasco of The Prime MinisterialLodge renovation, is worthy of a sketch. Mad As Hell needs more Samuel Beckett. I love the Catholicly Theology stuff. High Class if Black white Collars or Men in RED dresses Posh! Actores could never play such parts – – so Lucky the Power of ABC Mad as Hell don’t need to recreate stuff. I can not Fault One interview Brilliance 29.58 seconds Eat ya heart out 60Min oops I can say that? Mad as Hell (July 20, 2016): Moments of satirical brilliance interspersed with just enough silliness to break the horrid reality of the Australian political scene. It’s the only way to stay sane under the circumstances. Our new ‘stable’ Federal government is sure to provide plenty of material for new episodes. But even worse, now that Trump is one step away from ruling the Western world, and the new PM in Great Britain has already declared she’ll not hesitate to push the nuclear button, it appears that the ducks are all lining up for a tension-filled and insular future in world politics. We’ll need you more than ever Shaun; so please keep doing what you’re doing.